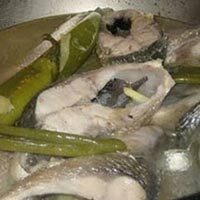 Paksiw na isda is also known as boiled pickled fish. Cut fish in to 4 slices and place them in teflon or porcelain coated skillet. Add all the other ingredients listed above, cover, and boil. After reaching the boiling point, simmer about 8 to 10 minutes and make sure to turn fish once to cook evenly. Transfer to a covered dish and store the fish in the refrigerator for 1 to 2 days. Reheat over moderate heat before serving.